Here’s the thing with low mains water pressure; water suppliers don’t care. The chances are, your property is suffering from “slightly low” pressure, or a “recent drop”. 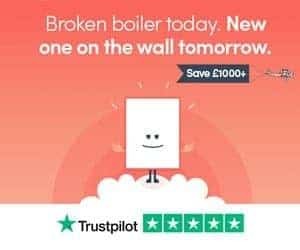 As long as these suppliers are providing you with mains water pressure within the guidelines of their terms and conditions, you’re on your own! The fix? A home booster pump. And our top pick, the aptly named Salamander Home Boost, is one of the very best. Salamander are a leading UK pump supplier, based in Sunderland. And they’ve spent over 4-years of R&D, putting together their Home Boost product. At my 2-years working in a plumbing merchant, we sold a tonne of Salamander’s pumps. The majority of what we sold were shower booster pumps, but home booster pumps were popular too. And, with high sales volume and lack of returns, I can vouch for the quality of Salamander as a brand. If they were junk, we’d have stocked another brand; simple. Jump over to a tap with a bowl. Crank the tap open to its maximum, and measure out the water you’re left with after 60 seconds. If you’ve got seriously low mains water pressure, you might be measuring out as little as 4 litres. So, due to lack of pressure, all you’ll get from other taps and showers, is around 4 litres per minute. With the Salamander booster pump, that rockets up to 12 litres per minute. It’s likely to provide a boost of actual pressure by up to 1.5 bar, and it then regulates flow at up to 12 litres per minute. As part of The Water Supply (Water Fittings) Regulations (1999), incoming water supply can be pumped to achieve up to 12 litres per minute, hence that being the regulated maximum output of the Home Boost. Adios to ridiculously slow filling baths, showers that are little more than a spray, and a whole host of combi boiler problems! But don’t flash your cash just yet. There’s big problem with pumps, of any kind in fact; they’re loud. Most manufacturers focus on the functionality of the pump, but not what it’s like for people like you and me, to live with day in, day out. That’s bad news, unless you find the sound of a constant drone soothing, while you’re trying to sleep. Salamander have made noise reduction a focus. So much so, that it’s been tested and awarded Quiet Mark status. You can read more about Quiet Mark on the UK Noise Abatement Society’s website. Installing a Home Boost isn’t particularly difficult. 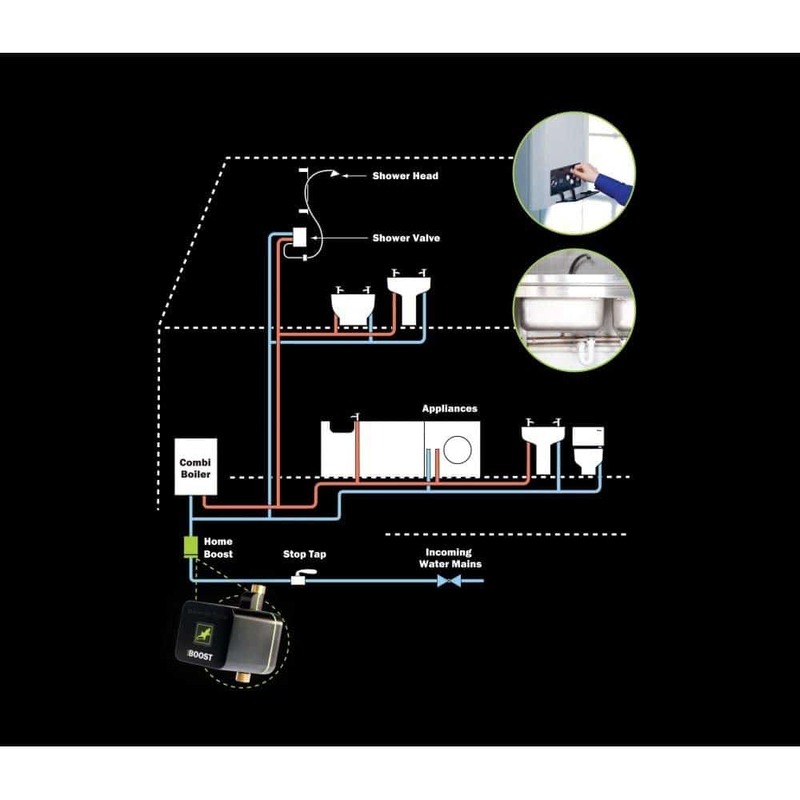 With a few tools, and a bit of DIY know-how, you can install the Salamander Home Boost, without paying a plumbing or heating engineer. There’s a great installation guide on Salamander’s YouTube channel (below). Typically, an installation of this kind can be done in less than 1 hour. There’s a good chance you’ve come across cheap copies of the Home Boost. At the end of the day, you get what you pay for. Salamander are leading pump brand, so provide a warranty to match. You’ll get 2-years warranty with your purchase of Home Boost. It’s unlikely these cheap copies offer the same (or any) warranty, and certainly won’t be as efficient or quiet. The Salamander Home Boost is a sealed unit, so you shouldn’t need to service it. If you do however, run into problems, Salamander’s technical team (PumpWise) can be contacted on 0191 516 2002. Where Can You Buy The Salamander Home Boost? There’s a tonne of plumbing merchants and DIY stores where you can pick up a Home Boost pump. But, if you’re looking to buy one from the comfort of your sofa, cuppa’ in hand, they’re also on Amazon here. 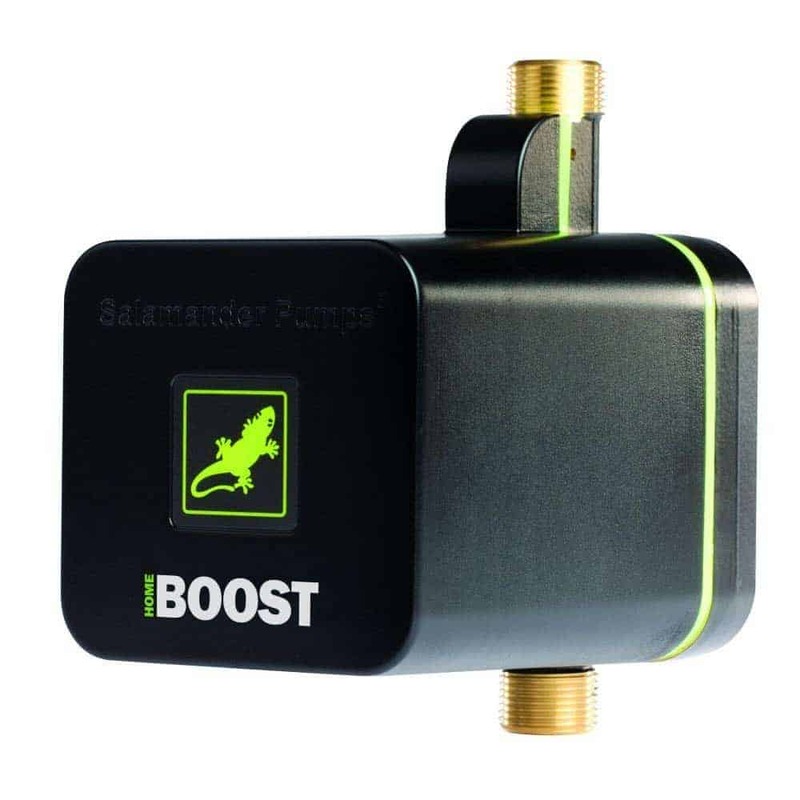 If you’re looking for a quiet, efficient and powerful pump, delivering up to 12 litres per minute, the potential for an additional 1.5 bar of pressure and from a leading manufacturer, then the Salamander Home Boost is where we’d be heading. Got a Home Boost, or alternative mains booster pump? Got an opinion on it? Or, got questions about mains water pressure? Drop a comment below, and we’ll get back to you as soon as possible.